When I was making the banner for Artomatic, I created a violin-playing bunny to stand upon the letter “B” in the blue half of the image. I liked this guy quite a bit, so I decided to feature him on the “About” sign at the show. When my parents came to visit, my mom remarked how much she liked “the fiddler.” She asked me why he wasn’t on the web site. I realized this fellow did deserve a proper image of his very own own. So, I created a (mostly) new image, which is now posted to the Works in Progress page. Here you go, mom – here’s your bunny blue. Artomatic is a wrap! It was fun, but I’m also glad it’s over. Time to go back to the drawing board (or tablet, in my case), and get lost in the process of creating. Below is a picture of my installation. We didn’t have 100% control over our spaces. Lots of restrictions on lighting, and the weird box attached to the wall on my space, meant for suboptimal conditions (and unavoidable glare on some images). Still, I learned a lot for whatever may come next. I’ll post pictures of my wall soon. The show runs through June 23. For more information about how to plan a visit (hours, parking, etc. ), click here. Announcing two new images “Snow Falling” and “End Game,” both now at the top of the Works in Progress page. I’m continuing to refine all of the images on this page, in the hopes of making prints and showing them at Artomatic in less than two months! Thanks as always for taking a look. A new year, new characters… I’ve added a significantly revised image, “Pick Me,” to the Works in Progress page. In other news, I intend to participate in Artomatic again this year, which will run from May 18-June 24 in Crystal City. 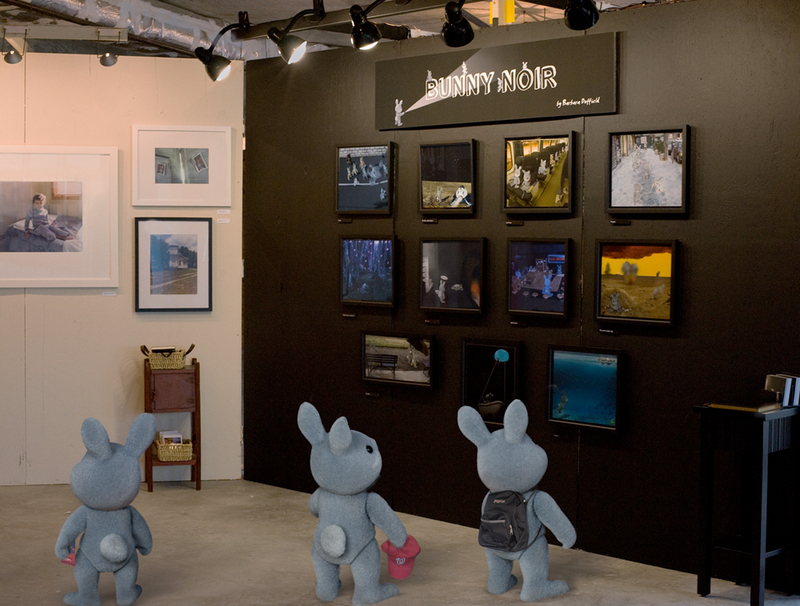 I’m looking forward to bringing my bunnies to life through print making and display. For more information on the show, check out Artomatic’s web site. Because the land of the dead isn’t a place of reward or a place of punishment. It’s a place of nothing. The good come here as well as the wicked, and all of us languish in this gloom forever, with no hope of freedom, or joy, or sleep, or rest, or peace. But now this child has come offering us a way out and I’m going to follow her. Even if it means oblivion, friends. I’ll welcome it, because it won’t be nothing. We’ll be alive again in a thousand blades of grass, and a million leaves; we’ll be falling in the raindrops and blowing in the fresh breeze; we’ll be glittering in the dew under the stars and the moon out there in the physical world, which is our true home and always was. So I urge you: come with the child out to the sky! Exciting news! “Be Where How?” is now on display at Unity Woods Yoga Center studios in Washington DC, Bethesda, MD, and Ballston, VA. This wonderful opportunity allowed me to experiment with making larger prints. The images are 23″ x 36,” making it much easier to see the details. I’m thrilled that my bunnies (and cats and foxes) found a home at Unity Woods – especially since the yoga studio in the image bears more than a passing resemblance to the Unity Woods studio in Washington DC….although the students do not! Unity Woods is phenomenal, offering first-rate yoga instruction and a high-quality experience. Very highly recommended. At long last, the “Works in Progress” page is up! This page will display images that are not yet finalized, but are ready for a web-based preview. Much has happened in the two years since the first batch of Bunny Noir images: new equipment, new characters, new ideas. Several of the new images are very detailed, and alas, the web is not ideal for their display. But until I have the opportunity to display large prints, the web will have to suffice. Click HERE to check them out. Thanks as always for viewing! It’s been quite some time since I’ve added anything to this web site, but that doesn’t mean that I’ve stopped playing with my bunnies. One of my images (a larger print of “Last Train”) is included a show at National Airport, in the original airport lobby, by the walkway to Terminal A. The show, “Artomatic Takes Flight,” is a diverse collection of painting, photography, sculpture, and mixed media. It will run through June 25, 2011. Also, I have five new additions to Bunny Noir. I am creating a “Works in Progress” section of my website to display them. I’m hopeful that the images will be up in the next few weeks. Artomatic wrapped up a few weeks ago. My bunnies and I thoroughly enjoyed the experience. I just finished a new image, “Heavy Weight,” which can be viewed in the Images and Slideshow pages. I hope to finish at least one more image before the summer is officially over. As usual, ideas are more plentiful than time. 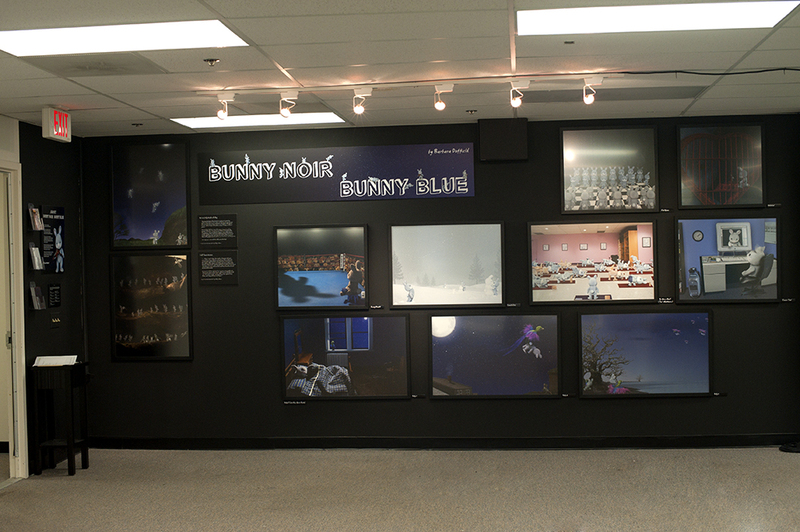 Last night was the bunnies’ big debut at Artomatic. Opening night was quite fun: fantastic art, awesome energy, and tasty food and drink. Overall the night was great. Below is a picture of my wall and some of the visitors.